Rain. *bleeping* rain. So, yesterday was a day reminiscent of the day we stayed under the bridge with Cubbie and Dilly Dally in Pennsylvania. Cold, cold, miserable rain. There are practically no shelters on this trail, however there are a couple in this section and thankfully we ended up at one yesterday for lunch where we could actually eat lunch instead of stopping for five minutes to shove a few bars down our throat and continuing on with our heads down. If we hadn’t been close to town it would’ve been a place we’d of holed up in for the day. And then we white blazed into down. 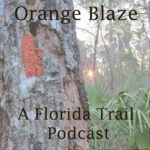 That’s kinda a blue blaze, but sometimes there are alternate white blazes around really bad parts of trail, in which that wasn’t really a bad part coming up, but it was going to cut about four or five miles off our day as the trail meanders around the Suwannee River there and avoids going through most of White Springs—and we were cold and soaked through so we said we’d just road walk into town. It was pretty miserable. So, the motel we’re at we decided is a one step up from the Doyle hotel in Duncannon and a step down from the Relax Inn in Atkins. It’s more of a place that people live at than come to stay for a night or two. The manager debated for a minute where he could put us, then cleaned it then went to Dollar General to buy us towels and a rug. That’s how interesting it is. But it’s just fine for hiker folks! There have been some trail maintenance issues in this section, particularly in a section called the Lake Butler Forest, which is really a timber plantation and sometimes the trail goes through these clear cuts with awful, awful rows and in between are full of water. Again we were nicely offered some white blazes down some other logging roads and we pondered why they bothered putting them in such a section to begin with. You could see the trail off to the side by the only pine trees left standing with the blazes. We are supposed to be having better weather these next few days with a chance of rain on Thursday that I’m hoping is passing and not an all day event again. Then it appears to be sunshine, sunshine, sunshine—whoopppiiieeee! As for the tent we’d already decided when we got home we’d order a new tent because our fly leaks. There is just so much condensation and rain and dew from the humidity here that it never dries out so some of the tape is delaminating. But then the other day we noticed a pole was cracking and that was it, we didn’t think it would last another month. So, we called up Travel Country an Orlando based outfitter yesterday and had them overnight a new tent to us and it arrived this morning. *phew*. So, hopefully we are all set for awhile. Both Chris and I are kinda curious as to the last 500 miles. 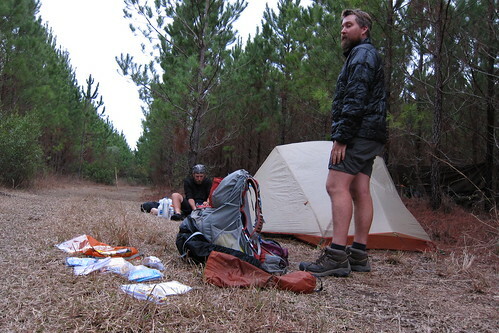 We really don’t know much about the Panhandle other than our short stint near Camel Lake in Appalachicola. We do know we may be wading in some water in Bradwell Bay and in the Appalachiacola section, but other than that we are kinda unsure about it as we never really explored this area. 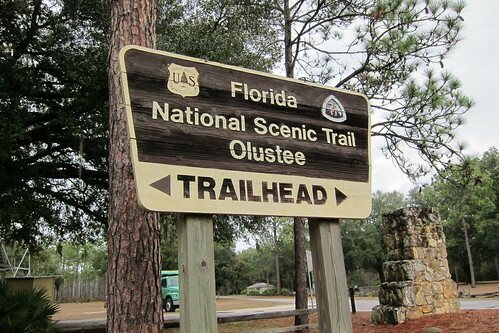 I do know we walk along the Suwannee for a few days before heading towards the Big Bend of Florida and St. Marks NWR. 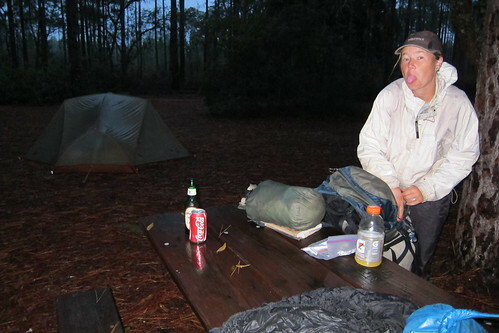 Camping in Lake Butler Forest—with Speaker. Packing up yesterday morning in the rain. 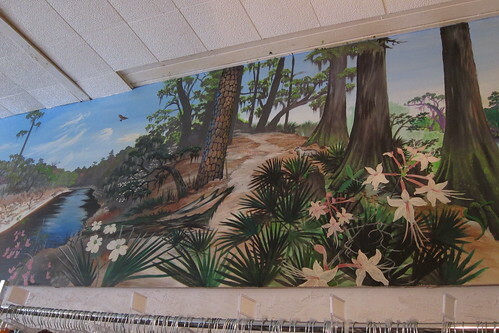 A mural in an old building here in White Springs. It used to be a cafe but seems to have closed and is now something else. A lot of things in White Springs are different and more outdated than what the book says. Oh, the highlight of yesterday was seeing our second skunk. It was kinda cute just toddling down the side of a dirt road, we let it cross the road before we kept going (didn’t want to smell like skunk and be wet!). No photo though. Just 500 miles to go! Yeah for you guys! Do you still have the Fly Creek tent? We are still trying to decide what tent we’re going to buy … we pretty much ruled out the Fly Creek because even though it’s so light, we read reviews about the condensation/leaking and we wanted a little more space in the tent. We’ll have to talk when you get home. Well hope the new tent is a good one.